Hassanzadeh, F., Smith, J., Nicholls, P. (2006). Synthesis and Biological Screening of 1,3-Dialkyl Derivatives of 4-(2’5-Dioxopyrrolidine-3-yl) Phenyl Sulphinic Acid as Inhibitors of Oestrone Sulphatase. Iranian Journal of Pharmaceutical Sciences, 2(4), 215-224. Farshid Hassanzadeh; John Smith; Paul J. Nicholls. "Synthesis and Biological Screening of 1,3-Dialkyl Derivatives of 4-(2’5-Dioxopyrrolidine-3-yl) Phenyl Sulphinic Acid as Inhibitors of Oestrone Sulphatase". 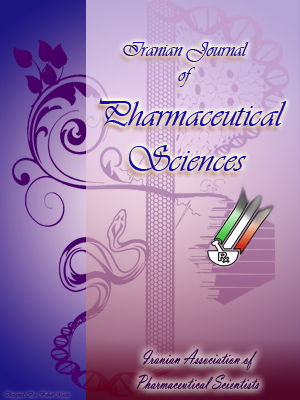 Iranian Journal of Pharmaceutical Sciences, 2, 4, 2006, 215-224. Hassanzadeh, F., Smith, J., Nicholls, P. (2006). 'Synthesis and Biological Screening of 1,3-Dialkyl Derivatives of 4-(2’5-Dioxopyrrolidine-3-yl) Phenyl Sulphinic Acid as Inhibitors of Oestrone Sulphatase', Iranian Journal of Pharmaceutical Sciences, 2(4), pp. 215-224. Hassanzadeh, F., Smith, J., Nicholls, P. Synthesis and Biological Screening of 1,3-Dialkyl Derivatives of 4-(2’5-Dioxopyrrolidine-3-yl) Phenyl Sulphinic Acid as Inhibitors of Oestrone Sulphatase. Iranian Journal of Pharmaceutical Sciences, 2006; 2(4): 215-224. 1,3-dialkyl 3-phenylpyrrolidine-2, 5-diones were modified to produce potential steroid sulphatase inhibitors. These modifications were aimed at producing compounds, which could be expected to bind reasonably well to the active site of the steroid sulphatase enzyme but could not be hydrolyzed readily by the enzyme due to the covalent S-C bond present. In this regard the sulphinic acid derivatives of di-substituted 3-phenylpyrrolidine-2, 5-diones were prepared. On biological testing, only compound 4-(2,5-dioxo-1, 3-dipentylpyrrolidine-3-yl) phenylsul-phinic acid (F5) was found to be an inhibitor of the steroid sulphatase enzyme from human placenta and was about twice as potent as the known inhibitor danazol. Oestrogen concentrations in plasma are similar in oestrogen receptor positive and oestrogen receptor negative cancer patients , thus in situ formation of oestrogen is thought to make a major contribution to the high concentration of oestrogens in breast tumors . The presence of the aromatase enzyme complex in 50-60% of breast tumors  may play an important role in local oestrogen synthesis [2, 4]. Oestrone sulphatase on the other hand is present in most breast tumors and is about a million-fold more active than aromatase [5-6]. At the physiological concentrations of oestrone sulphate and androstenedione the amount of oestrone produced via the sulphatase pathway is ten times higher than through the aromatase pathway, suggesting that in breast tumors the sulphatase pathway is the main route for the in situ production of oestrogens . Steroid sulphates were thought to be the end products of steroid metabolism for a long time but it is now clear that sulphate conjugates of steroids are important intermediates in the synthesis, transport and action of steroid hormones [8-10]. Among a number of existing steroid sulphates, oestrone sulphate (E1S) and dehy-droepiandrosterone sulphate (DHEA-S) have the highest supporting role in breast tumor growth. Serum oestrone sulphate levels are 10 times higher than those of unconjugated oestrone and oestradiol , and the half-life of oestrone sulphate is much longer than that of free oestrone and oestradiol . Oestrone sulphate is important as an oestrogen precursor, which can be converted to free oestrone and oestradiol via oestrone sulphatase and 17ß-hydroxysteroid dehydrogenase (17ß-HSD). The fact that oestrogen sulphatase inhibitors could provide a means to block oestrogen biosynthesis has led to the synthesis and evaluation of a number of potential steroid sulphatase inhibitors for use, either alone or in conjugation with an aromatase inhibitor, as potential therapeutic agents [10, 13-14]. Oestrone sulphate, the natural substrate for oestrone sulphatase has a flat phenolic ring, and an extended hydrophobic structure, so that logically in the development of potential inhibitors of oestrone sulphatase this backbone should be represented. 1,3-Dialkyl-3(4’-aminophenyl)pyrrolidine -2,5-diones “potent aromatase inhibitors”  resemble this requirement in having a flat aryl ring with a pitched flat heterocyclic ring with two extended hydrophobic alkyl chains. The chains can freely rotate and are capable of interaction with an existing hydrophobic binding site on the enzyme active site. Since the backbone of this structure is reasonably fitted in the aromatase active site, it could be similarly fitted in the sulphatase active site. Introduction of a suitably positioned sulphonate or similar moieties (sulphinate, etc) into the aromatic ring of this structure could make it capable of interaction with the enzyme active site but could not be hydrolyzed readily by the enzyme due to the covalent S-C bond present (Figure 1). This could result in inhibition of oestrone sulphatase enzyme. Figure 1. Two dimentional structures of 4-(2,5-dioxo-1, 3-dipentylpyrrolidine-3-yl) phenyl sulphinic acid F5 and oestrone sulphate. All reagents and solvents employed were of general purpose grade. Melting points were determined on a Gallenkamp hot stage apparatus and are uncorrected. Infra-red spectra were obtained as solid via a diffuse reflectance accessory using KBr matrix, or between NaCl plates using a Perkin Elmer 1600 series FTIR. 1H-NMR spectra were recorded on either a Perkin-Elmer R32 instrument (90 MHz), a Bruker DPX 300 (300 MHz) spectrometer or a Bruker WM 360 instrument (360 MHz) as dilute solutions in CDCl3 or DMSO-d6 with tetramethysilane as internal standard. Mass spectra were determined at the SERC Mass spectrometry Service Center, University College of Swansea, UK. Elemental analyses were determined at the School of Pharmacy, University of London. Since preparation of the 1,3-dialkyl derivatives of 4-(2,5-dioxopyrrolidine-3-yl) phenyl sulphate or sulphonic acid were unsuccessful , the synthesis of the corresponding sulphinic acid was undertaken by the method outlined in Scheme 1. Scheme 1: Synthesis of 1,3-dialkyl derivatives of 4-(2,5-dioxopyrrolidine-3-yl) phenyl sulphinic acid. CHX-CHAHB), 2.71 (1H, dd, JAB = 18Hz and JXB = 5Hz, CHX-CHAHB). The 3-phenylpyrrolidine dione (F1) (12 g, 68.6 mmol) was added portionwise to the stirred fuming nitric acid (72 ml) maintained at a temperature of - 39 ·C to - 40 ·C using a dry ice / petroleum ether bath. Each portion was added when the previous one had totally dissolved. The solution was then poured with vigorous stirring into ice/water (500 ml) and allowed to stand at 5 ·C overnight when 3-(4-nitrophenyl)-pyrrolidine-2, 5-dione (F2) precipitated as a white solid (6.4 g, 39.5%). An analytical sample was recrystallised from ethanol, m.p. 137.5-141.5 ·C (Lit., ), 134 – 137 ·C]. νmax 3300 (N-H), 1770 , 1710 (C=O, imide), 1600 (C=C, Ar), 1510 , 1345 (NO2) cm-1; δH (90MHz ; CDCl3), 8.23 (2H, d, J = 9Hz, 3’,5’-PhHa), 7.65 (2H, d, J = 9Hz, 2’,6’-PhHb), 4.38 (1H, dd, JAX = 8Hz and JBX = 5Hz, CHX-CHAHB), 3.22 (1H, dd, JBA = 18Hz and JXA = 9Hz, CHX-CHAHB), 2.84 (1H, dd, JAB = 18Hz and JXB = 5Hz,CHX-CHAHB). 3’,5’-PhH), 7.7 (2H, d, J = 9Hz, 2’,6’-PhH), 3.57 (2H, t, J = 7Hz, N-CH2-CH2-), 3.15 (1H, d, JBA = 18Hz, CHAHB-(C=O)), 2.95 (1H, d, JAB = 18Hz, CHAHB-(C=O)), 2.2 - 0.75 (20H, m, C-(CH2)4-CH3, N-CH2-(CH2)3-CH3). 7Hz, N-CH2-CH2-), 3.03 (1H, d, JBA = 18Hz, CHAHB-(C=O)), 2.8 (1H, d, JAB = 18Hz,CHAHB-(C=O)), 2.2-0.6 (20H, m, C-(CH2)4-CH3, N-CH2-(CH2)3-CH3). Sodium nitrite solution (20%, 1 ml) was added dropwise to a stirred solution of 3-(4-aminophenyl)-1,3-dipentylpyrrolidine-2,5-dio ne (F4) (0.5 g, 1.5 mmol) in 25% sulphuric acid (10 ml). On completion of the reaction (starch paper) acetone was added as a co-solvent and SO2 gas was bubbled into the solution until no further gas uptake was observed (constant weight of the reaction mixture). The mixture was transferred to a beaker containing copper powder (2 g), stirred at room temperature for 2h and finally filtered through a bed of celite. The residue was washed with acetone (20 ml) and glacial acetic acid (20 ml) and the combined filtrates diluted with water (100 ml). Refrigeration of the mixture overnight, furnished a white precipitate which was collected, washed with water (10 ml) and dried at 40 ·C under vacuum to give the sulphinic acid F5 as pale yellow crystals (0.29 g, 50.7 %) m.p. 86.5-88.1 ·C. (Found: C, 63.15; H, 7.65; N, 3.72. C20H29NO4S requires; C, 63.30; H, 7.70; N, 3.69%). νmax 2959-2860 (C-H), 1773 , 1701 (C=O, imide), 1595 (C=C, Ph), 1039- 1010 (S=O, str) cm-1. δH (300 MHz; CDCl3) 10.3 (1H, br s, O-H), 7.9 (2H, br s, 3’,5’-PhH), 7.6 (2H, d, J = 6.6Hz, 2’,6’-PhH), 3.58 (2H, t, J = 7.3Hz, N-CH2), 3.15 (1H, d, JBA = 18.3Hz, CHAHB-(C=O)), 3 (1H, d, JAB = 18.3Hz, CHAHB-(C=O)), 2.03 (2H, m, C-CH2-CH2-), 1.62 (2H, quintet, J = 7.5Hz, N-CH2-CH2-), 1.4-1.1 (10H, m, N-CH2-CH2-(CH2)2-CH3, C-(CH2)3- CH3), 0.95 - 0.83 (6H, m, (CH3)2). A mixture of the 3-(4-nitrophenyl) pyrrolidine-2,5 dione (F2) (6 g, 27 mmol), 1-iodopropane (18.5 g, 110 mmol) and potassium carbonate (15 g, 109 mmol) in acetone was stirred at 60 ·C under reflux for 5 h. The mixture was filtered and the filtrate evaporated. The residue was dissolved in ether (40 ml), washed with water (2 ×20 ml), dried (MgSO4) and clarified with activated charcoal. The clear solution was concentrated and fractionated on a column of dry silica using petroleum ether (60-80)-ethyl acetate (4:1, 100 ml) to initially remove the excess of iodopropane. Separation was then continued with petroleum ether (60-80)-ethyl acetate (2:1) as eluent. Evaporation of the main fraction gave an orange oil, which solidified on trituration with petroleum ether (60 - 80) to give the dione (F6) as a white powder (4 g, 48.1%). An analytical sample was recrystallised from ethanol, m.p. 61.9-62.8 ·C, (Lit., ), 63.0-63.2·C] ; νmax 3100-2860 (C-H), 1777 , 1690 (C=O, imide), 1600 (C=C, Ar), 1520 , 1345 (NO2) cm-1, δH (90 MHz ; CDCl3) 8.27 (2H, d, J = 9Hz, 3’,5’-PhH), 7.7 (2H, d, J = 9Hz, 2’,6’-PhH), 3.55 (2H, t, J = 7Hz, N-CH2-CH2-CH3), 3.18 (1H,d, JBA = 18Hz, CHAHB-CO), 2.95 (1H, d, JAB = 18Hz, CHAHB-CO), 2.02 (2H, t, J = 8Hz, C-CH2-CH2-CH3), 1.9-0.8 (10H, m, N-CH2-CH2-CH3, C-CH2-CH2-CH3). A solution of the 1,3-dipropyl-3-(4-nitrophenyl)-pyrrolidine-2,5-dione (F6) (3 g, 12.7 mmol) in absolute ethanol (50 ml) was placed in a hydrogenation flask. Palladium 10% on charcoal (0.3 g) was added and the flask evacuated, filled with hydrogen and shaken until no further hydrogen uptake was observed. The catalyst was removed by filtration through a bed of celite and the filtrate concentrated under reduced pressure to afford a white solid which was recrystallized from ethanol to give the amine (F7) (1.9 g, 54.3%) as a white powder, m.p. 95.5-96.4 ·C (Lit., ), 95.7-96.4 ·C]; νmax 3450-3360 (NH2), 3040-2870 (C-H), 1770 , 1690 (C=O, imide), 1610 (C=C, Ar) cm-1; δH (90MHz ; CDCl3), 7.17 (2H, d, J = 9Hz, Ph-H), 6.62 (2H, d, J = 9Hz, Ph-H), 3.47 (2H, t, J = 7Hz, N-CH2-CH2-CH3), 3.05 (1H, d, JBA = 18Hz, CHAHB-C=O), 2.77 (1H, d, JAB = 18Hz, CHAHB-C=O), 2.1 - 0.6 (12H, m, CH2-CH2-CH3, N-CH2-CH2-CH3). reaction was completed (starch paper) 50% sulphuric acid (4 ml) was added and SO2 was introduced into the reaction mixture until a constant weight was obtained. The mixture was then transferred to a beaker containing copper powder (1 g), and the contents stirred mechanically for 1 h, and then filtered trough a bed of celite. The residue was washed with acetone (3 ×10 ml) and the filtrate was evaporated and the residue extracted with ether (2 ×20 ml). The combined ethereal extracts were washed with water (10 ml), dried (MgSO4) and concentrated to give a yellow viscous oil (0.3 g), which was fractionated using preparative TLC plates (20×20×0.1 cm) with ethyl acetate-methanol (3:1). The main band was separated and washed with acetone (4×5 ml) through a small sintered funnel. The filtrate was evaporated to give the sulphinic acid (F8) as a yellow oil (0.13g, 36.4%). [Found: C, 57.85; H, 6.40; N, 4.24. (M+NH4)+ 341.1535 C16H21NO4S (1/2 H2O) requires C, 57.80; H, 6.67; N, 4.22%. (M+NH4)+ 341.1535]. νmax (neat) 2963 - 2875 (C-H), 1773 , 1698 (C=O, imide), 1595 (C=C, Ph), 1044 , 1012 (S=O) cm-1. δH (360 MHz ; DMSO) 7.58 (2H, d, J = 8.1Hz, 3’,5-PhH), 7.4 (2H, d, J = 8Hz, 2’,6’-PhH), 3.4 (2H, overlap with water in DMSO, N-CH2) 3.08 (1H, d, JBA = 18.4Hz, CHAHB-(C=O)), 3.05 (1H, d, JAB = 18.4Hz, CHAHB-(C=O)), 2.07 - 1.8 (2H, m, C-CH2-CH2-CH3), 1.48 (2H, sextet, J = 7.2Hz, N-CH2-CH2-CH3), 1.3 - 0.95 (2H, m, C-CH2-CH2-CH3), 0.87 (3H, t, J = 7.1Hz, C-(CH2)2-CH3), 0.78 (3H, t, J = 7.3Hz, N-(CH2)2-CH3). A mixture of the 3-(4-nitrophenyl) pyrrolidine-2,5-dione (F2) (6 g, 25.4 mmol), iodobutane (24 g, 131 mmol) and potassium carbonate (11 g) in acetone (50 ml) was stirred at 60 ·C under reflux for 6 h. The powder bed was collected by filtration and filtrate was evaporated to dryness. The residue was dissolved in ether (50 ml), washed with water (2×10 ml), dried (MgSO4) and concentrated to give a yellow oil (8.9 g), which was fractionated on a column of dry silica with light petroleum ether-ethyl acetate (5:1) as eluent. Evaporation of the main fraction gave the nitro dione (5.5 g, 65.3 mmol) as a white solid. An analytical sample was recrystallised from ethanol to give the nitro dione (F9) as white crystals, m.p. 78.9-80.1 ·C (Lit., ), 81.1-81.6 ·C]; νmax 3100-2840 (C-H), 1770-1690 (C=O, imide), 1520-1350 (NO2) cm-1; δH (90MHz ; CDCl3), 8.2 (2H, d, J = 9Hz, 3’,5’-PhH), 7.68 (2H, d, J = 9Hz, 2’,6’-PhH), 3.55 (2H, t, J = 7Hz, N-CH2-CH2-CH3), 3.15 (1H, d, JBA = 18Hz, CHAHB-(C=O)), 2.90 (1H, d, JAB = 18Hz, CHAHB-(C=O)), 2.0 (2H, t, J = 8Hz, C-CH2-CH2-), 1.9 - 0.7 (14H, m, C-CH2-CH2-CH3, N-CH2-CH2-CH2-CH3). Sodium nitrite 20% (1 ml) was added to a stirred mixture of the 3-(4-Aminophenyl)-1,3-dibutyl-pyrrolidine-2,5-dione (F10) (0.5g, 1.6 mmol) in 20% sulphuric acid (7 ml) at 5 ·C. After completion of the reaction (starch paper) 50% sulphuric acid (5 ml) was added and SO2 gas introduced until no further SO2 absorption was observed (constant weight). The mixture was then transferred to a beaker contain copper powder (1 g), stirred for 1 h at room temperature and filtered through a bed of celite. The residue was washed with acetone (20 ml) and glacial acetic acid (20 ml). The filtrate was diluted with cold water (150 ml) and refrigerated overnight to give a white solid which was collected, washed with water (10 ml) and dried to yield the sulphinic derivative (F11) as a white fine powder (0.2g,35.6%) m.p. 93-94.3 ·C. [Found: C, 61.29; H, 7.18; N, 3.93%. (M+NH4)+ 369.1848. C18H25NO4S requires C, 61.52; H, 7.17; N, 3.99%. (M+NH4)+ 369.1848]. νmax 2960-2860 (C-H), 1765 , 1690 (C=O, imide), 1595 (C=C, Ph), 1060-1010 (S=O, str) cm-1. δH (300MHz ; CDCl3) 7.8-7.55 (4H, m, Ph-H), 3.43 (2H, t, J = 7Hz, N-CH2), 3.15 (1H, d, JBA= 18.3Hz, CHAHB-(C=O)), 3.08 (1H, d, JAB= 18.3Hz, CHAHB-(C=O)), 2.1-1.85 (2H, m, C-CH2-CH2), 1.45 (2H, quintet, J = 7Hz, N-CH2-CH2-CH2-CH3), 1.3-0.95 (6H, m, N-CH2-CH2-CH2-CH3, C-CH2-CH2-CH2-CH3), 0.855 (3H, t, J = 7.2Hz,N-(CH2)3-CH3), 0.83 (3H, t, J = 7.3Hz, C-(CH2)3-CH3). Tubes (in triplicate) with an assay volume of 0.5 ml containing substrate [6,7-3H]-oestrone sulphate ammonium salt (10 µl of 400 nM stock in propylene glycol) and oestrone sulphate potassium salt (10 µl of 60 µM in ethanol), inhibitors (20 µl of 5 mM solution in absolute ethanol), NADPH generating system (50 µl, NADP, 0.0082 g/ml; G-6P, 0.0228 g/ml; G-6PD, 15 µl/ml (4IU)) and phosphate buffer pH 7.4 (5mM, 400 µl) were prepared. The content of the tubes were mixed and pre-heated in a water bath for 4 min. at 37 ·C. The final substrate concentration was 1.2 µM. The enzyme reaction was started by addition of 10 µl of 25 mg/ml human placental microsomes. The tubes were incubated for 35 min. at 37 ·C and the reaction was terminated by addition of mercuric chloride (300 µl, 1 mM). To each tube ethyl acetate (3 ml) was added and the tube then vortexed for 10 sec. The tubes were left at room temperature for 10 min. and the organic layer was then transferred to another set of tubes where the ethyl acetate was evaporated to dryness as previously described and the residue was reconstituted in 100 µl of absolute ethanol. A 50 µl of aliquot was injected into the HPLC system equipped with a 10 µm C18 µBonda pack column (3.9×300 mm, Millipore) and an on line radioactive detector using a mixture of 50:50 HiSafe 3 and methanol as scintillation fluid. The results were analyzed using an available data base system.The inhibitory potency of the compounds was calculated by comparing the rate of reaction to that of a control as determined by measuring the area under the curve of the metabolite peak in comparison to that of the control . Statistical analysis was performed using one-way analysis of variance (ANOVA) with post hoc Tukey test. p< 0.05 was considered significant. The biological assay described here for sulphatase inhibition was kindly carried out by Dr M. Ahmadi at the Welsh School of Pharmacy, university of Wales, college of Cardiff, England. At 200µM concentration among 3 novel 4-(2,5-Dioxo-1,3-dialkylpyrroline-3-yl) phenylsulphinic acids tested here (F5, F8, F11) only F5 showed detectable inhibition (30.06%). In the assay danazol (200 µM), a known inhibitor gave 20% inhibition. The most likely cause of low activity in this series of compounds as sulphatase inhibitors is due to, (1) the higher polarity of the pyrrolidine dione ring compared to that of the C-ring of the steroid backbone and, presumably, consequent rejection by an existing hydrophobic region in the enzyme active site, since F5 with lower polarity due to longer side chines on pyrrolidine dione ring showed better inhibitory effect. (2) the lack of binding by the shorter alkyl chains (propyl and butyl) which are oriented above the plane of the steroid binding site. Possibly repositioning occurs to accommodate the alkyl groups and carbonyl groups in hydrophobic and hydrophilic areas respectively with movement of the –SO 2-group away from the active site. Since the only active compound in this series (F5) has the longest side chain and the most flexible structure, synthesis of more lipophil structures by introducing the longer side chains on similar positions may result in productions of better oestrone sulphatase inhibitors. Fishman J, Nisselbaum JS, Mendez-Botet CS, Schwarts MK. Estrone and estradiol contentin human breast tumors: Relationship to estradiol reseptors. J Steroid Biochem 1977; 8: 893-6. Tilson-Mallett N, Santner SJ, Feil PD, Santen SJ. Biological significance of aromatase activity in human breast tumours. J Clinical Endocrinol Metabolism 1983; 57: 1125-8. Reed MJ, Owen AM, Lai LC, Coldham NG, Ghilchic MW, Shaikh NA, James VHT. In situ osterone synthesis in normal breast and breast tumour tissues: Effect of treatment with 4-hydrox-yandrostenedione. Int J Cancer 1989; 44; 233-37. Santer SJ, Feil PD, Santen RJ. In situ oestrogen production via oestrone sulphatase pathway in breast tumours: Relative importance versus the aromatase pathway. J Clinical Endocrinol Metabolism 1984; 59: 29-33. Saito T, Kinoshita S, Fujii T, Bandoh K, Fuse S, Yamauchi Y, Koizumi N, Horiuchi T. Development of novel steroid sulfatase inhibitors: II. TZS-8478 potently inhibits the growth of breast tumors in postmenopausal breast cancer model rats. J Steroid Biochem Mol Biol 2004; 88: 167-73. Reed MJ, Purohit A. Sulphatase inhibitors: the rationale for the development of a new endocrine therapy. Rev Endocrine-Related Cancer 1993; 45: 51-62. Purdy RH, Engel LL, Oncley JL. The charactri-sation of oestrone sulphate from human plasma. J Biolo Chem 1961; 236: 1043-50. Vignon F, Terqui M, Westley B, Derocq D, Rochefort H. Effects of plasma estrogen sulphatase in mammary cancer cells. Endocrinology 1980; 106: 1079-86. Purohit A, Woo LWL, Chander SK, Newman SP, Ireson C, Ho Y, Grasso A, Leese MP, Potter BVL, Reed MJ. Steroid sulphatase inhibitors for breast cancer therapy. J Steroid Biochem Mol Biol 2003; 86: 423-32. Prost O, Turrel M, Dahan N, Craveur C, Adessi GL. Estrone and dehydroepiandrosterone sulfatase activities and plasma estrone sulfate leveles in human breast carcinoma. Cancer Res 1984; 44: 661-4. Purohit A, Reed MJ. Oestrogen sulphatase activity in hormone-dependent and hormone-independent breast cancer cells: Modulation by steroidal and non-steroidal therapeutic agents. Int J Cancer 1992; 50: 901-5. Vihko P, H rk nen P, Soronen P, T rn S, Herrala A, Kurkela R, Pulkka A, Oduwole O, Isomaa V. 17β-Hydroxysteroid dehydrogenases-their role in pathophysiology. Mol Cell Endocrinol 2004; 215: 83-8. Duncan LJ, Purohit A, Howarth NM, Potter BVL, Reed MJ. Inhibition of estrone sulphatase activity by estrone-3-methylthiophosphonate: A potential therapeutic agent in breast cancer. Cancer Res 1993; 53: 298-303. Whomsley R, Smith HJ, Nicholls PJ, Nazareth W, Ahmadi M. Some 1-, and 3-substituted 3-(4’-aminophenyl)pyrrolidine-2,5-diones as selective inhibitors of aromatase. J Enzyme Inhibition 1993; 6: 317-30. Hassanzadeh F. Design and synthesis of inhibitors of steroid sulphatase and 17beta-hydroxysteroid dehydrogenase as potential agents in the treatment of breast cancer. PhD Thesis, 1996, University of Wales. Daly MJ, Jones GW, Nicholls PJ, Smith HJ, Rowlands MG, Bunnett M. Synthesis and biochemical evaluation of analogues of aminog-lutethimide based on phenylpirolidine-2,5-dione. J Med Chem1986; 29: 520-3.